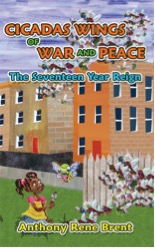 Seven-year-old Olivia and her new cicada friends find the importance of faith and love in overcoming challenges. A simplistic way of introducing the tiny creatures. Within the pages of Anthony Rene Brent’s new book Cicadas Wings of War and Peace readers will meet Olivia and her two cicada friends, Miya and Mora. Growing up in Baltimore, Maryland, in 2004, Olivia is lucky enough to meet these cicadas since they only come around every seventeen years. Together the cicadas help Olivia through tough times. A fun and fantastic journey for the whole family, Cicadas Wings of War and Peace will bring families closer through a new experience to look forward to together in 2021. Anthony Rene Brent is a judicial officer and is semi-retired from law enforcement. He grew up with the cicadas returning four times in his lifetime. He is currently working the sequel, Cicadas Return, which finds Olivia at age twenty-one with two children of her own who have their own adventures with the cicadas when they return in 2021. He is adapting both works into screenplays as well. For more information about the author, visit CicadaWings.com or contact RightSideOfQuadrant(at)hotmail(dot)com.